The only time I've found the analogue useful is in the boulder levels in Crash 1. I still need to pick this one up, classic games back in the day. I'm rubbish at the game but it'd fun, at least it starts you back on the same level if you lose all lives! i bought this as i remember the originals, i love playing it and oh the memories hehe. About time I bought it. Couldn't pass it up at this price! Their address is registered as Cash Converters Yorkshire so while I'm hopeful, I won't be surprised if it's cancelled or turns up used rather than new. Did you seriously find it that easy? the box feet have turned into oval feet on this game. This was practically the only way I found to get remotely close to the gold relic I needed. Even doing this method took me a long time to master the entire run. 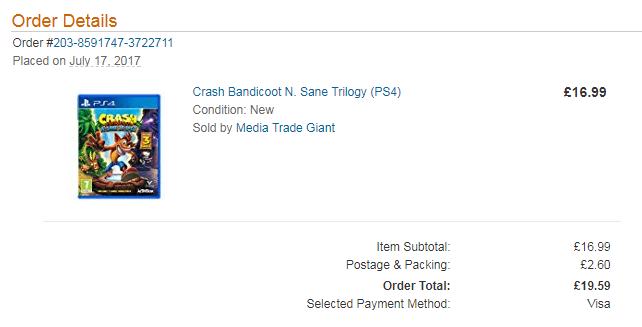 Yeah I found Crash 1 pretty easy to be honest, I hadn't long finished a play through of it on the original PS1 a few months back. The Lab platinum - ******* hell... Took me a good 3 hours to get that ridiculously tight ******** time. The High Road, Sunset Vista, Native Fortress, Road to Nowhere and Slippery Climb? Absolute cakewalks in comparison. The only level to come close in my opinion is Generator Room. Guys, just a heads up that the DLC Stormy Ascent is available now (for free). Well it has been since 21/07 but I didn't realise until now. Anyone tried this? I've just complete the first run and it doesn't seem all that bad at all. Getting a good time for the leaderboard will take work though but I don't see how this is the hardest level on the game. ETA: Just noticed that this will only be free up to the 19th of August, so make sure you grab this! Is this coming to x1? @Explosivo nothing has been officially confirmed yet but I think it will do. I think this might have been a time exclusive, so just keep an eye out. Hopefully you don't have to wait long! Can't see this happening now. Am I going to have to buy a ps4 just for this and Shenmue 3? Been playing through and loving it until it came to the high road.